The LISTOFMATERIALS.com is a web database that lists telecommunication equipment indexed by certifications and standards relevant to compliance with regulations pertaining to RUS telecom funding programs, such as the Buy American certification, operating in the tradition of the RUS List of Materials. Although the RUS List of Materials is gone borrowers are still obligated to purchase equipment meeting RUS standards and manufacturers must still demonstrate their compliance. RUS policy now requires that borrowers undertake the process of vetting equipment against RUS published standards in place of the function once provided by the RUS List of Materials including requiring they gather regulatory required documentation from manufacturers such as a manufacturer signed Buy American certification. Written documentation of this new policy from the RUS Administrator is available upon request. LISTOFMATERIALS.com is a place where manufactures electively preemptively post their compliance documentation for the benefit of program borrowers and engineers who use the site to find and select equipment based on its compliance with regulatory requirements and gather the documentation they need to meet funding program guidelines functioning as a valuable resource in the place of the retired RUS List of Materials. This site was created by telecommunications professionals who have been involved with the USDA’s RUS Telecommunications List of Materials since the 2003 launch of the Rural Broadband Access Loan and Loan Guarantee Program (Program Number 10.886) authorized by the Farm Security and Rural Investment Act of 2002 (Farm Bill), Public Law 101-171 and reauthorized by the Food, Conservation, and Energy Act of 2008 commonly known as the 2008 Farm Bill. Our specialty has been equipment acceptance application logistics related to broadband funding programs administered by RUS Telecommunications. Specifically, preparing and filing applications for equipment acceptance to Information Publication 344-2 Telecommunications List of Materials Acceptable for Use on Telecommunications Systems of RUS Borrowers (List of Materials or RUS LOM). On behalf of our clients we have filed successful applications resulting in the acceptance of hundreds of items of equipment to the RUS LOM between 2003 and its retirement May 23rd, 2011. Based on the duration and depth of our experience, and, our historically close collaborative working relationship with RUS including our contributions to modernizing the RUS LOM, evolving its categories, standards and the application process, we believe we are the world’s leading experts in the RUS Telecommunications List of Materials. We began working to convert the RUS Telecommunications LOM into a web friendly searchable database proceeding its May 2011 retirement. While the retirement of the RUS LOM came as a surprise to us we hastened our work and launched this site within six months of its retirement. We intend to build upon the site over time in phases. You can learn more about our planned phase approach on the "Stages of Development" tab above. This database lists all the equipment listed on the last RUS LOM published February 28th 2011 and several listings since its retirement May 23rd (information acquired by FOIA). Every data point from the LOM has been compiled in our database from acceptance date and equipment feature details to Buy American expiration making it the most comprehensive digital archive and documentation of the history of the LOM in existence. A fraction of the data is presently in use on this website. More data will be put into service over time as needed to meet the informational needs of the marketplace. Equipment is organized using the same categorization methodology as was implemented in the LOM with some modernizations, and, equipment is referenced using the exact same text as was used in the LOM for easy reference. We will continue to modernize the categorical conventions over time. Equipment will be added and removed on a rolling basis as manufacturers introduce new models and end-of-life others. If you are interested in having equipment added to this list please visit here. We are accepting equipment listing inquires at this email address; lar@listofmaterials.com. If you would like to keep current with updates do this database please subscribe to our email newsletter here. listofmaterials.com was initially created to fill the void left by the retirement of the RUS Informational Publication (IP) 344-2, "List of Materials Acceptable for Use on Telecommunications Systems of RUS Borrowers" but we realized that the market for a thoughtfully organized catalogue of telecommunications equipment listing relevant technical standards is of value to all telecommunication professionals, borrowers and non-borrowers alike. This database lists equipment suitable for use in modern telecommunications systems including those of RUS Borrowers and is designed to be a tool to help organizations find equipment that meets their needs as well as the requirements they have set for themselves or have been set for them by governing organizations such as RUS (should they ever be clearly stated). This site reports on standards met and acceptances earned from which a qualified engineer can draw their own conclusions regarding acceptability for use in their system. In the tradition of the RUS Telecommunications List of Materials this site lists telecommunication equipment suitable for systems designed, deployed and operated by Rural Telecoms. Equipment is organized by category and identified by what nationally recognized standards it has been certified to comply with, starting with a manufacturer's self-certification as compliant with the REA Buy American Act of 1938 as amended. Additional certifications will be added over time. The RUS Telecommunications List of Materials was an invaluable source of information critical to the work of RUS borrowers trying to meet RUS regulatory obligations. In one document the RUS LOM identified Buy American status, technical performance, and adherence to national standards. The information was utilized by borrowers and the greater community of Rural Telecoms. Being accepted to the RUS LOM was required for equipment used in Borrower’s systems and over its many years in service set the high bar standard of excellence in reliability and performance. While the document has been retired Borrowers are still responsible for using only equipment that meets the same rigorous reliability, performance, and standards conformance requirements, though they must ascertain as much by their own means. This website is here to help them. LOM's value by using the modern tools of the Internet to bring ease of search and access and greater depth to the data. We intend to do this while remaining committed to the core founding purpose of the LOM which was to provide nformation about equipment acceptable for use on telecommunications systems of Rural Telecoms. RURAL TELECOMS (Borrowers and non-borrowers) to find quality, reliable, high-performing equipment designed for their special needs and in the case of RUS borrowers, to meet the regulatory obligations as (when) they are defined by RUS Telecommunications regarding conformance with the Buy American requirement and equipment performance. RURAL TELECOM ENGINEERS to shop a marketplace with equipment actively targeting their special needs and organized by nationally recognized standards. Helping them help their clients meet their goals and regulatory obligations and helping them find the best equipment to suit their deployments. The engineer now has a resource they can access to investigate equipment qualifications on a case-by-case basis as certification information and so much more is documented and available to them here. EQUIPMENT MANUFACTURERS to help them reach an audience actively designing and deploying systems and being given a unique opportunity to market special programs directly to that audience. Also, freeing up manufacturers from having to answer questions about compliance with potentially gating regulatory guidelines every time they field an inquiry. 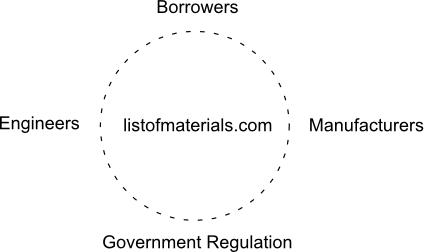 As the image below depicts the goal of listofmaterials.com is to act as a facilitating resource at the center of work between Borrowers, Engineers, Manufacturers and the government. The vision, direction and growth milestones planned for this site have been developed in anticipation of the needs of the marketplace. They are subject to change based on input from the marketplace. We invite your suggestions as to how we might improve this informational service. Any and all ideas are welcome. Please send ideas and comments to comments@listofmaterials.com. Publish RUS Telecommunications List of Materials as a web searchable database including all data in the last publishing of the LOM and equipment accepted between last publishing and retirement (obtained via FOIA). Among the first certifications to itemize we shall identify the Buy American compliance status of each listed item as of the LOM’s last publishing. We will also begin the process of inviting manufacturers to renew their status for annual terms as was the intention of the RUS LOM prior to its retirement. We use a form of our own design with conformance language that matches legacy RUS compliance documentation starting with a manufacturer's self-certification as compliant with the REA Buy American Act of 1938 as amended. c) Within a metric what standard deviations are acceptable, i.e. what are acceptable parameters. RUS did not permit the use of every variation of an item of equipment. This function will build on that wisdom. For more information about the advisory panel and how to be involved please refer to the "Standards Initiative & Advisory Board" tab above. Educate manufacturers as to how this site renders product information and begin the process of ‘cleaning up’ the RUS Telecommunications LOM data to fit the scaffolding structure of this database. The RUS data was not in a tabular format making it a challenge to convert in to a standardized table structure. The result is that some fields in the database are empty at the time of the launch of the site. We would like to normalize (complete empty fields) the tables with the help of manufacturers so the tables are complete making searching and finding equipment easier for our visitors. Identify which performance metrics will be catalog for each item. Performance or version under each metric we track as determined by Advisory Panel. Additional development is planned. Contact listofmaterials.com to discuss our long and short-term plans. May 2011 RUS Administrator Jonathon Adelstein abruptly retired the LOM requiring RUS borrowers to preemptively capitulate to RUS equipment guidelines and leaving them to their own means to do so. For over 50 years the List of Materials served two important purposes: 1) It identified materials acceptable for use on telecommunications systems of RUS borrowers; and, 2) Set the standards by which telecommunication equipment would be judged. The List of Materials was managed by a division of the USDA, the Rural Utility Service (Telecommunications), also known as RDUP or RUS. For informational purposed we have composed historical accounts about RUS and the List of Materials. Rural Development (RD) has been known as the Rural Development Utilities Program (RDUP), The Rural Utility Service (RUS) and prior to that, The Rural Electrification Administration (REA). RUS resides within the U.S. Department of Agriculture (USDA) and administers over $115 billion dollars of existing loans and nearly $20 billion of new program loans, loan guarantees, and grants in the current fiscal year to rural business, cooperative, housing, utilities and community development programs. Their financial and technical support of essential public facilities and services are vital factors in helping to make sure rural citizens can participate fully in the global economy. To ensure that borrowing organizations were making sound purchasing decisions and positively investing taxpayer dollars all materials used in the construction of government funded rural telecommunications system had to be listed in RUS Informational Publication (IP) 344-2, "List of Materials Acceptable for Use on Telecommunications Systems of RUS Borrowers," unless specific written approval has been granted by the Administrator. The List of Materials Acceptable for Use on Telecommunications Systems of RUS Borrowers is also known as the "List of Materials" or "LOM". RUS Bulletin 345-2, had established Agency policy that materials and equipment purchased by RUS telecommunications borrowers or accepted as contractor - furnished material, must conform to RUS standards and specifications where they have been established and, if included in RUS IP 344-2, "List of Materials Acceptable for Use on Telecommunications Systems of RUS Borrowers," (List of Materials), must be selected from that list or must have received technical acceptance from RUS. Therefore manufactures wishing to sell their products to RUS borrowers had to request RUS consideration for acceptance of their products and submit data demonstrating their products' compliance with RUS specifications. Compliance with RUS specifications and standards was demonstrated in part via presentation of laboratory tests results and other informational data upon which the determination of acceptability would be made. RUS evaluated this data to determine that the quality of the products is acceptable and that their use would not jeopardize loan security. In the Telecommunications program, because of the complex and highly technical nature of equipment, services and system architectures, RUS also required a manufacturer to demonstrate successful product use in a working telecommunications system as part of the acceptance process. We are actively seeking to develop advisory panels. If you would like to join an advisory panel to help define categories and the standards used on this site and what compliances and metrics will be tracked please contact us by email at general@listofmaterials.com, or you may contact us by phone at 206-745-2031.